A world of renewable energy and sustainability is becoming more and more prevalent with car manufacturer Hyundai announcing the 'World's First Solar-Charging' vehicle. As early as next year, Hyundai enthusiasts will be able to take their first glimpse of the 'solar-charging combustion engine vehicle', which will feature a 100-watt solar panel on its roof. The solar power panel will work much the same way as a conventional panel, with its placement on the roof allowing it to absorb sunlight and transform it into energy. 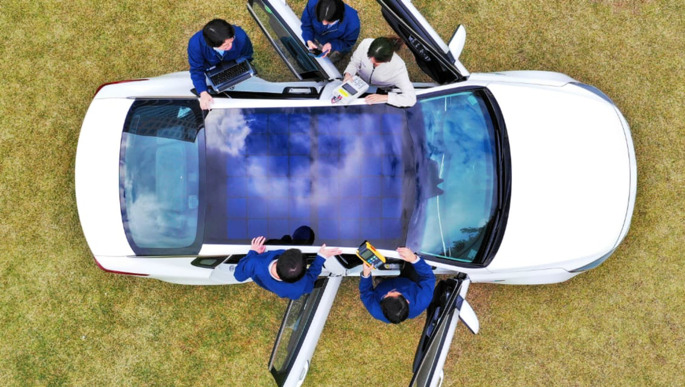 Hyundai's executive vice president of engineering and design, Jeong-Gil Park said, "The solar roof is the first of these technologies, and will mean that automobiles no longer passively consume energy, but will begin to produce it actively." Hyundai is thrilled to be setting a new pace for introducing electricity-generating technology to the vehicle industry. Mr Jeong-Gil Park further reiterates, "It is an exciting development for us, designing a technology for vehicle owners to help them shift from being energy users to being energy producers." For all Australian's, this new breed of renewable energy will be suitable for most, especially due to the ideal summer weather conditions. The solar panels are expected to charge up 60 per cent of the car's battery capacity in a single day, which is ideal for most urban and rural commuters who leave their car in the sun all day. Hyundai has announced that they will introduce this new form of technology early next year onto their Hybrid models first. The second-generation technology will have the solar panels applied to tractional internal combustion vehicles (which is where they're claiming a world first), and third-generation panels will be introduced to Hyundai's EV range.